Send Best Collection of Fresh Flowers to Chennai. Gifts to Chennai. Send Flowers to Chennai. Description : Coming in a unqiue basket, there are 6 Red and 6 White Roses in a basket with lots of greenary and a canldle in the centre . The exotic arrangement of the fresh roses can add glamor to the scenic decor of the place it is kept. This sophisticaed flower arrangement as a gift will surely suit occasions like birthdays and anniversaries. What beautifies the whole arrangement is the stylish candle that is places in the middle. 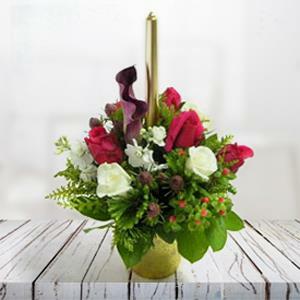 This elegant arrangement personifies sheer beauty and can be sent to Chennai through Gift2Chennai.com.With this, you can send other Gifts to Chennai as well.